Spring is almost here, and flipping through this trade catalog might help you dream of warmer days to come. The catalog is entitled Ranger Bicycles (1921) by Mead Cycle Co.
Just a look at the front cover will probably make you think of Spring. It shows a man riding a bicycle, likely a Ranger Bicycle, with his tie blowing in the wind. 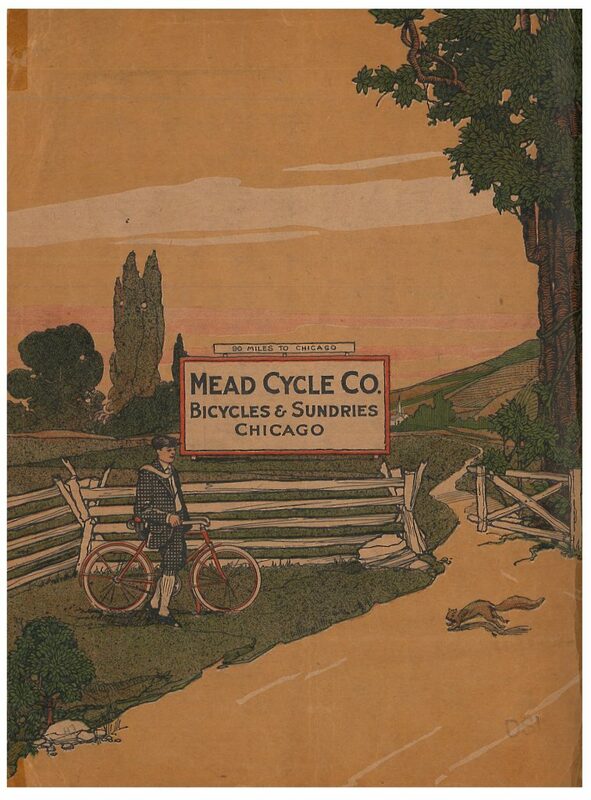 Mead Cycle Co. manufactured bicycles for both men and women as well as young boys and girls. Mead Cycle Co., Chicago, IL. Ranger Bicycles, 1921, front cover of catalog. According to the catalog, Mead Cycle Co. sold directly to the rider instead of using distributors and dealers. Speaking directly to the customer, the catalog’s introductory page explains the benefits of bicycling to work or school, running errands, and other uses for the bicycle. It also mentions the opportunity to breathe fresh air while biking. The catalog even addresses children by suggesting a bicycle would speed up the the time it took to run errands for their mother. Mead Cycle Co., Chicago, IL. 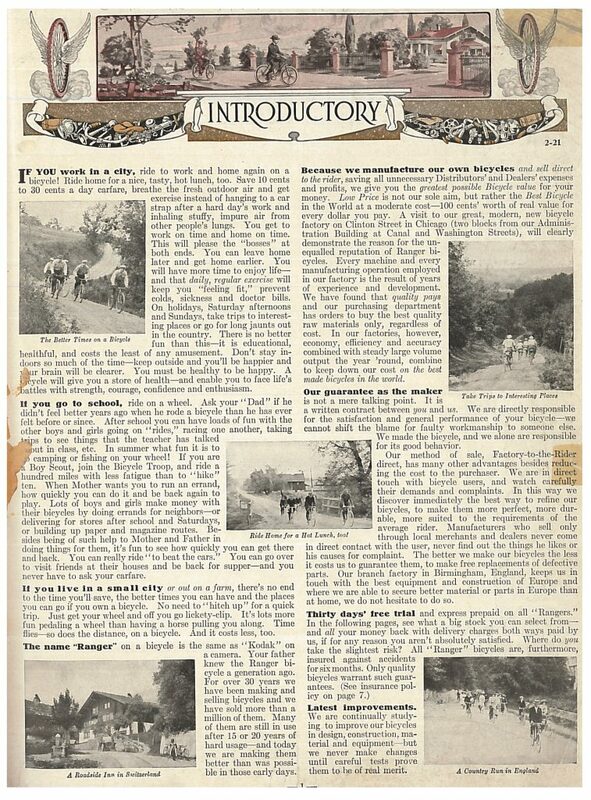 Ranger Bicycles, 1921, page 1, Introductory page showing several illustrations of people riding bicycles in different settings. A boy in 1921 running an errand might have ridden a bicycle called the “Prince” while a girl might have ridden the “Princess.” Because these bicycles were smaller than adult bicycles, the parts were proportional to fit the smaller size bicycles. These bicycles were enameled in golden brown with a bit of ivory white. Each bike came with a Cyclist’s Home Tool Kit of accessories such as a pump, oiler, and repair tools. Mead Cycle Co., Chicago, IL. 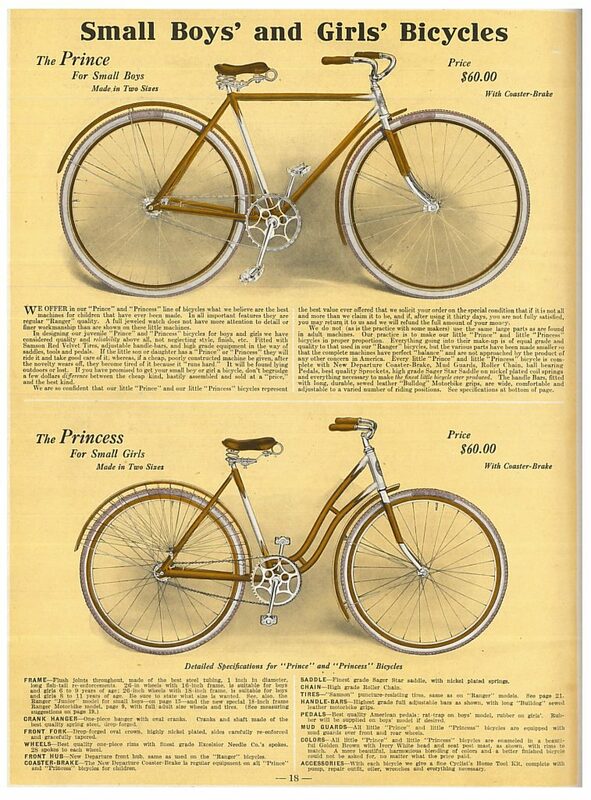 Ranger Bicycles, 1921, page 18, “Prince” boys’ bicycle and “Princess” girls’ bicycle. Several bicycles for adults are also shown in the catalog. One of these bicycles is the Pathfinder Model “A.” It was available in both ladies’ and men’s versions with the same basic features except the ladies’ version had a few extras. This included a padded saddle, rubber pedals, and extra guards, such as a netted skirt guard over the rear wheel. The catalog page below shows both styles, the larger illustration being the men’s version and the smaller image being the ladies’ version. Mead Cycle Co., Chicago, IL. 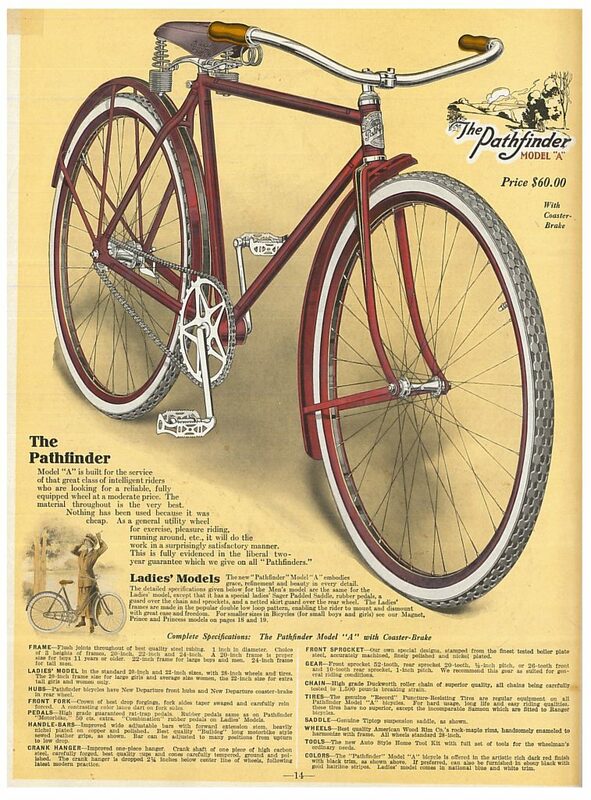 Ranger Bicycles, 1921, page 14, Men’s and Ladies’ Pathfinder Model “A” Bicycles. The littlest riders could ride dark maroon velocipedes like those shown below. Built for both boys and girls, these velocipedes featured adjustable handlebars and an adjustable saddle to accommodate the growing child. The added benefit of these adjustable features was the ability to re-adjust once again before handing the bike down to a little brother or sister when the older child outgrew it. Mead Cycle Co., Chicago IL. 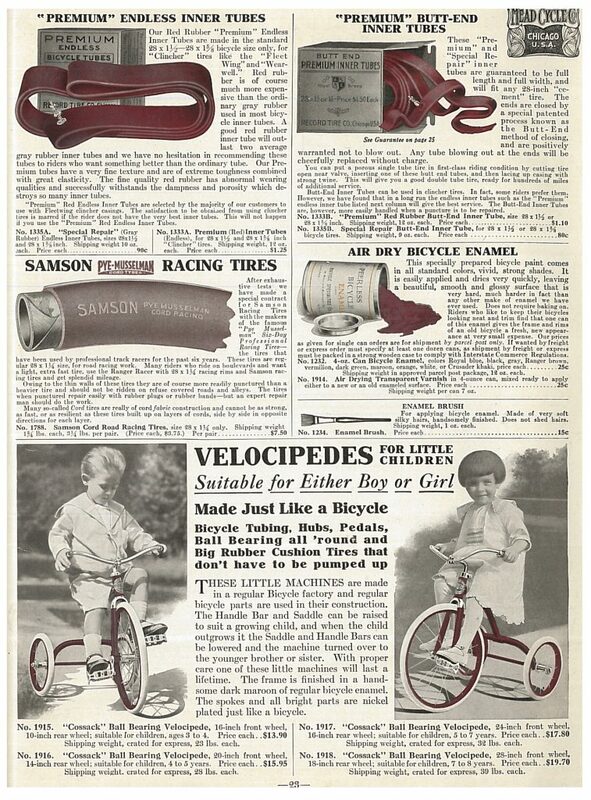 Ranger Bicycles, 1921, page 23, Velocipedes for boys and girls and bicycle accessories such as inner tubes, racing tires, and enamel. More bicycle models as well as parts and accessories are also included in this catalog. Shown above are inner tubes, racing tires, and bicycle enamel. The air dry bicycle enamel came in a variety of colors such as royal blue, black, gray, dark green, maroon, orange, and more. Mead Cycle Co., Chicago, IL. Ranger Bicycles, 1921, back cover of catalog. 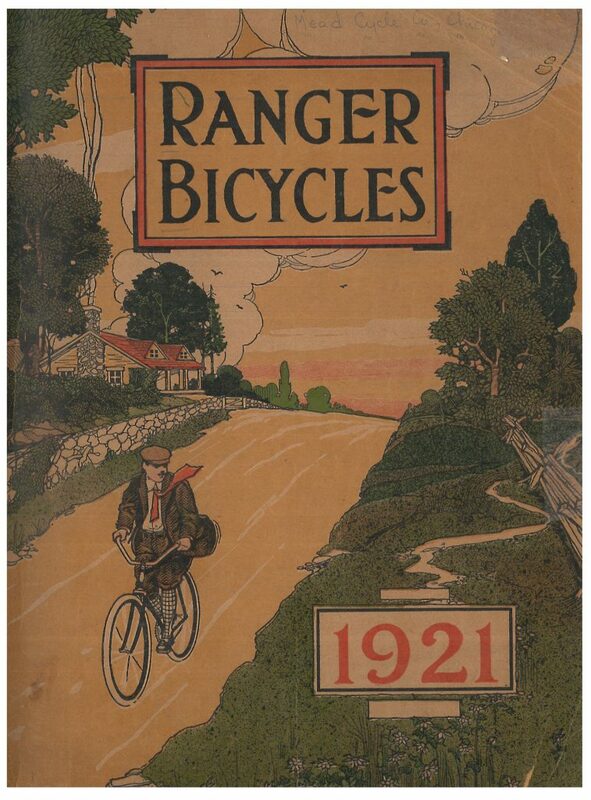 Ranger Bicycles (1921) and other catalogs by Mead Cycle Co. are located in the Trade Literature Collection at the National Museum of American History Library. Looking for more bicycle trade literature? Take a look at a post highlighting a late 19th Century European bicycle tour.